According to Merriam-Webster, a proclamation is "an official statement or announcement made by a person in power". As Christians we are given Christ's power of attorney to act on His behalf. 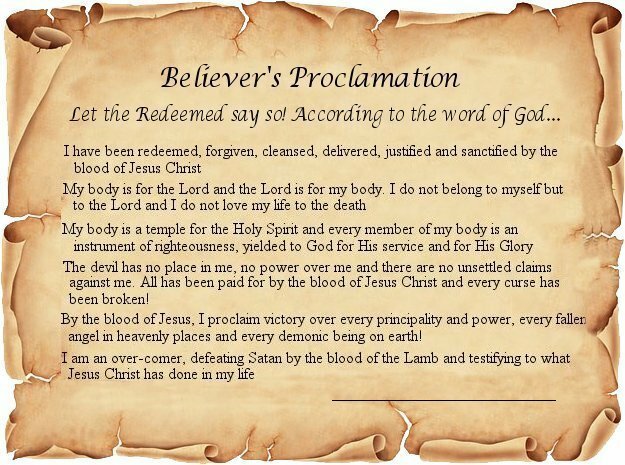 In the following proclamation we are stating our current and future state of authority 'on earth, as it is in heaven' and, as the redeemed of the Lord, are putting any and all demonic forces on notice that we are representatives of the most high God. Like any other official proclamation, this one needs to be signed. Feel free to print it out, sign it and hang it on your wall. It's the most important document you'll ever put ink to.